Indian Trees, Palms and Bamboos. An album of original watercolour drawings. Folio (484 x 300mm. ), 19 original watercolour drawings, one of a Jay dated 1864, the others of various species of Indian and Sri Lankan trees in locations including Shimla, Ratnapura, Kozhikode, Delhi and elsewhere, mounted in a slightly earlier morocco gilt album, covers with inset marbled paper panels, contemporary red morocco lettering-pieces on upper cover and spine, the paper toned. Striking studies of trees, made on a demanding journey begun late in Lear’s life. The trip was at the behest of Lear’s friend Lord Northbrook, viceroy of India, who supplied him £1,000 of commissions. In 1872, Lear’s first attempt to reach the subcontinent was abandoned at Egypt due to ill health, but he tried again the following year. “In October 1873 Lear and [his servant] Giorgio Kokali left once more for India… This time the journey was uneventful, and they docked in Bombay in late November. It was the start of a fifteen-month journey in which they travelled from the west to the east, and from the north to the south of the subcontinent, fulfilling a rigorous itinerary for a man who was now in his sixties. When they reached Ceylon in November 1874, Kokali became ill with dysentery, and Lear realized that they had had enough; they sailed from Bombay in January 1875” (ODNB). 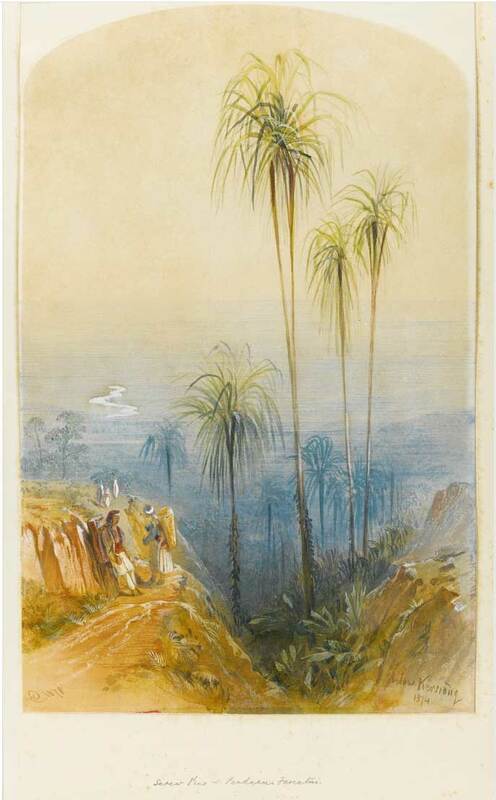 This entry was posted in Edward Lear and tagged Edward Lear, India, travel, watercolours. Bookmark the permalink. Where can we see more of the paintings in this album? Are they digitally scanned anywhere? Unfortunately, all the information Ihave is on Sotheby’s webpage. I’d also like to know if the album was acquired by a public institution. I do hope so. Those paintings deserve to be seen by more people. Are they originals or prints, I wonder, and if the latter, are the originals somewhere else?